Fighting climate change has been the driving force behind Jay’s career. As governor of Washington, he has enacted policies that make the state a national leader in clean energy, clean air and clean water. Jay created a new Clean Energy Fund, which has invested more than $100 million in developing and deploying innovative energy technologies, and growing clean energy businesses and jobs. He passed the largest and greenest transportation infrastructure investment package in state history. And he started the Clean Energy Institute at the University of Washington, which is pioneering research into next-generation renewable energy technologies like solar and battery storage. Jay was known as a climate leader in Congress, where he championed investments to grow America’s clean energy industries and introduced groundbreaking climate legislation. In 2007, he co-authored a book on the need for a large-scale effort for “igniting America’s clean energy economy” to create millions of jobs and transition America off fossil fuels. While in Congress, Jay voted against the Iraq War in 2003, voted against the repeal of Glass Steagall in 1999 and was one of Congress’ earliest proponents of net neutrality. Jay grew up in the Seattle area, where his father was a high school teacher and his mother worked as a clerk at Sears & Roebuck. Jay married his high school sweetheart, Trudi, and raised three sons. Jay and Trudi are now proud grandparents of three. Jay is an avid cyclist and hiker. He enjoys sketching scenes from around Washington, and writing and illustrating books for his grandchildren. Jay is committed to protecting Washington state’s clean air, water and natural lands for his grandchildren, and all children, to enjoy. Jay first got into public service to fight for a new public high school in his community. He then went on to serve in the state legislature and in 1992 was elected to represent the 4th Congressional District in rural Eastern Washington. He later moved back to the Seattle area and was elected to Congress in 1998 where he served until 2012. 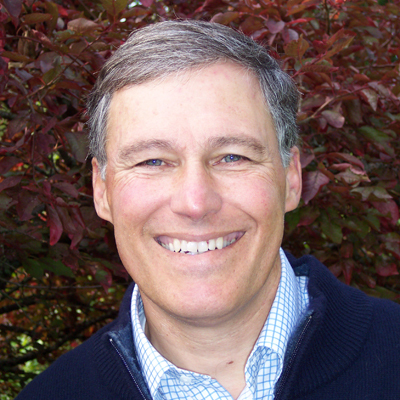 In 2012 he was elected Washington's 23rd governor and is currently serving in his second term. 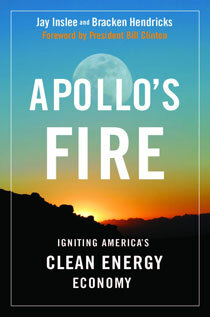 With Bracken Hendricks, he is co-author of Apollo's Fire: Igniting America's Clean Energy Economy.